This game, invented by Lawsome (a member of these forums! ), was played a lot on here in 2012-15. I've spoken to some friends, and there seems to be some interest in a revival, so here goes! Link to original thread and its two sequels. Here are the rules. Mostly the rules of the original game, written by Lawsome, without any of the later more complicated modifiers so we can keep things simple. 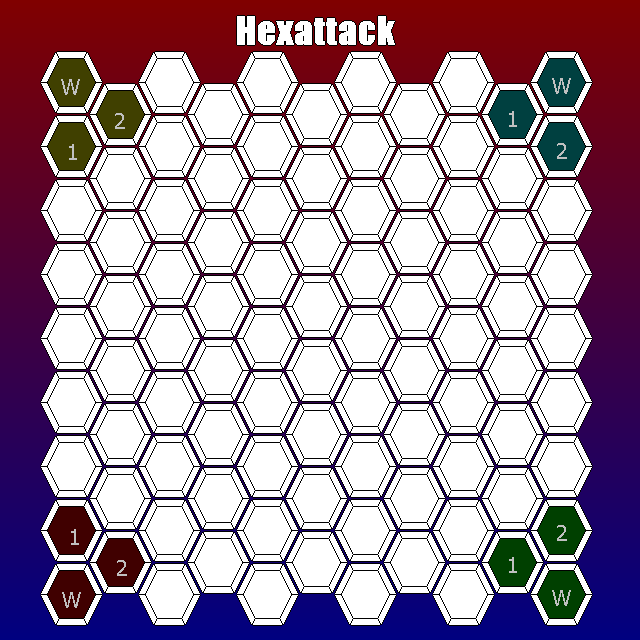 Hexattack is a game of prediction and teamwork, you control a great warrior (Or warriors), represented by a coloured hex on the battlefield, you, in co-operation with your allies, must defeat the other team and take over the battlefield, there are two ways to play, depending on how many players join, but the basic rules remain the same. You control a warrior or multiple warriors, each turn you will post in a spoiler the actions you wish to carry out, For instance: ATTACK UP, or DEFEND DOWN-RIGHT, you may only perform ONE ACTION PER WARRIOR A TURN. Once everyone has posted their moves for the turn in a spoiler, I will activate all your moves at THE SAME TIME, there is no turn taking here. 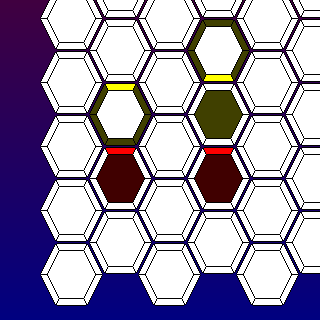 This means that a lot of the game will boil down to trying to guess your opponents next actions. “Should I attack them? Or are the greens going to attack me? If they are, I should block, But what if they are too busy defending against to yellows...” And so on, basically, it could very well rip your head to smithereens. Needless to say, you may not look inside the spoilers posted by other players. 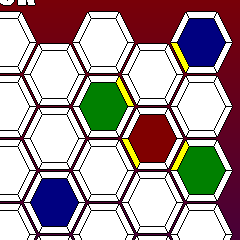 Places where warriors WERE LAST TURN are represented by filling ALL AVAILABLE BORDERS WITH THAT HEX'S COLOR. I would like to point out here that to remove difficulty with the rules I perform all moves in the following order. That means I carry out ALL THE GRAB MOVES, by ALL THE PLAYERS, ALL AT ONCE. Followed by all the defends, than all the attacks, etc etc. This will come in very useful later on. There are 5 different moves, the first I will cover is the ATTACK MOVE. 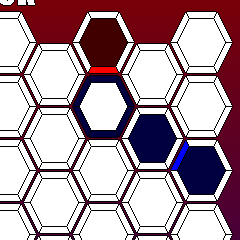 The attack move, if successful will destroy the warrior at the hex, if there is no warrior at the targeted hex nothing happens. 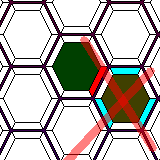 It is represented on the board by FILING IN THE BORDER THAT MATCHES THE DIRECTION OF THE ATTACK, RED. 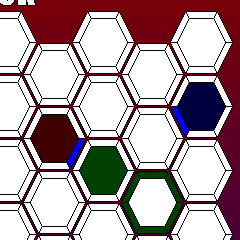 As stated before, attacking counts a a move, and you can make one move a turn, therefore, you cannot attack two hexes with one warrior in one turn. 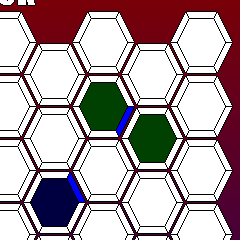 IF TWO HEXES ATTACK EACH OTHER, THE ATTACKS BOUNCE OFF AND NEITHER IS DESTROYED. Now, attacking would be boring if there wasn't a way to defend yourself, right? However, in this scenario, an attack from down, down-right, or up-right would have killed the warrior. Not that this move was done by blocking up left, not by blocking up or down left. Blocking up left also blocks from up and down left as well. I hope you understand that this move is impossible to perform. It would get seriously boring if your warriors couldn't move. 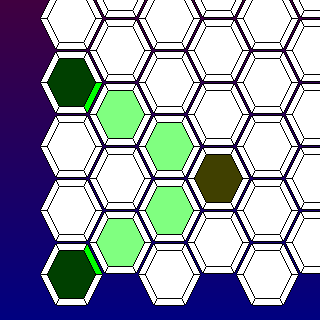 Well, you can also order your unit or units to move into adjacent Hexes, with the MOVE command. 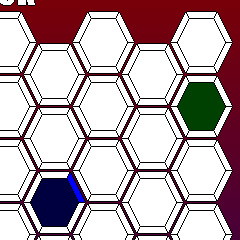 If two hexes warriors attempt to move into the same hex neither of them move. Two warriors may not directly change places. HOWEVER three or more warriors may ROTATE places provided no two warriors directly swap. It IS POSSIBLE to move into a hex that was previously occupied by a warrior who was killed, OR move into a hex that was occupied by a warrior who moved out of the hex DURING THE SAME TURN. This move exists primarily to stop players from cowering in the corners of the map continually blocking. It is also the only move with a set range of 2. If the hex the grab move is performed on is free, the next hex in that direction is instead effected (if it contains a warrior that is). The grab move brings the hit warrior one hex closer to you. Here the attack is out of range. 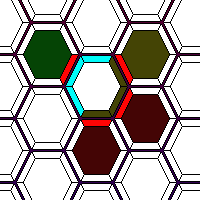 If a warrior is grabbed by two or more hexes at once it does not move. A warrior still counts as being “grabbed” even if they cannot move any closer to the performer of the action. 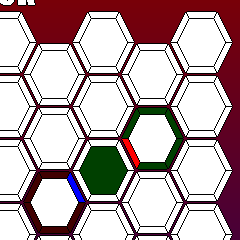 All this really does is mean that in this scenario the green hex counts as being grabbed by two people and therefore does not move. Also note that a warrior cannot be grabbed and pulled into the way of another grab, and then be pulled by that grab. 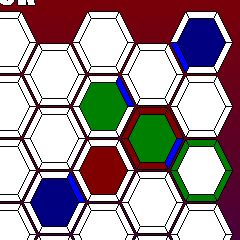 So the green hex is not then grabbed by the blue hex in this scenario. To have a good example of how all these come into play, take this tricky scenario. 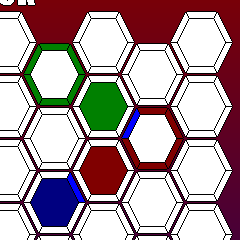 Also, note that a grab cannot be blocked by the defend command, as it happens before the defend command in the turn order, and the defend command only blocks moves that happen after it in the turn. In this game, the push command may only be used by wizards. When it comes to the point of the turn where all the push commands are activated, I freeze time (effectively) I then create a green ball at each warrior who is using Push. 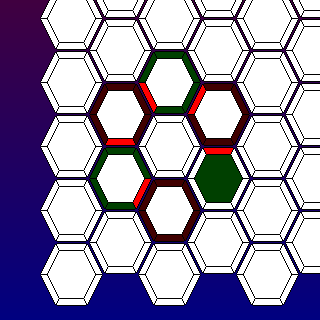 That ball will move in the direction specified as if it were continually using the move function. If the ball collides with a player and that ball IS NOT CARRYING ANOTHER PLAYER that player gets picked up and carried by it until neither the ball nor the player can move anymore. If a ball collides with another ball both balls are destroyed, if one or more of those balls were holding a player the player(s) are dropped and left in their new location. If a ball collides with a player and it IS carrying another player already, the ball is destroyed and the player it is carrying is dropped in its new location. ALL BALLS AND PICKED UP PLAYERS MOVE SIMULTANEOUSLY AND AT THE SAME SPEED. 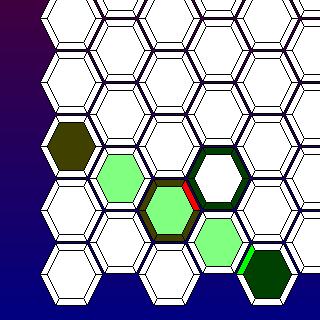 Once no more balls and players can be moved, the Push turn ends. If a warrior is the target of two or more pulses it will be affected by the one closest to it and the other pulses or pulse will pass by unaffected. If two or more or the pulses are of equal distance, then he does not move, even if there seems to be a plausible way out of it. Also, A push move can be blocked. In this case you do not move. You may remember me saying that the moves were carried out in the following order. This means I carry out all the grab orders, then the defend orders, followed by all the attack orders, then all the move orders and then all the Push orders. This removes a lot of problems. 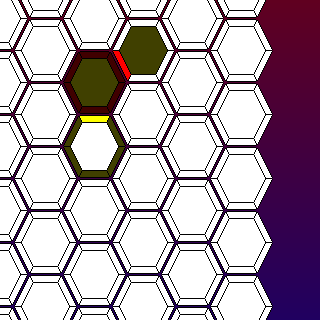 For instance, it is impossible to move away from an attack, as all attacks are performed before move actions. The only way to survive being attacked is to block that attack. 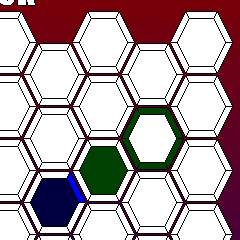 However, because move actions come after attacks, it is possible to move into a hex that is under attack and survive. Also, because Push is performed last, both of these moves are possible. Moving out of the way of as pulse. Attacking and killing a warrior while being hit by a pulse. Also, because grab is performed first, these moves are possible. Attacking and killing the hex attempting a grab on you. Using a grab to pull a warrior out of combat. Also, killed warriors still carry out their actions, so if you use a push command that order will happen even if you are killed in the process, it also makes this funky move collection possible. So, now we are nearly at the end of this long haul through the game, there is just one more thing. There is much variation between different matches, I will post up the special rules for the match when it starts. However, a lot of them rely on accumulating “points”, if a warrior that one of your warriors attacked is destroyed. Than you earn a kill point for your side. If more than one warrior attacks the same warrior and it is killed, you earn a point provided your attack would have made the kill without all the other warriors attacking the victim too. In this situation. Red earns one point as only one kill was made. Yellow earns one point as well. But green does not earn a point as their attack was blocked. The spoiler submitting your moves should go as following. Although the format doesn't really matter, this method is most compact. In this game, there are two types of warriors: wizards, and standard warriors. Only wizards (Represented by a W) may use the push command, but they may not use block defend. Last edited by patzer on Thu Aug 02, 2018 1:01 am UTC, edited 8 times in total. 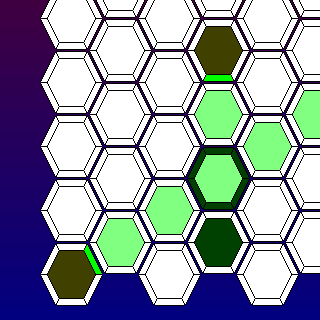 but the exact layout used will depend on the number of players. If we don't get any more signups in the next few days, I'll start this game on about Thursday with those three players, on a triangular board. Woo! Now we just need one more person to make it an awkward number! I'm pretty good at making things awkward on my own. 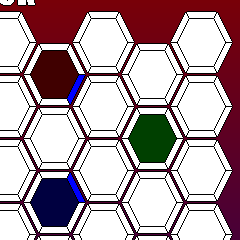 Currently making a 5-player gameboard, will start game later today assuming no more signups! /watching, maybe to join game 5.0, unless you're not anywhere near finalising the 5-starter setup and can stand a bit of a n00bie bulking out the simpler 6-player layout without wasting that effort. Soupspoon wrote: /watching, maybe to join game 5.0, unless you're not anywhere near finalising the 5-starter setup and can stand a bit of a n00bie bulking out the simpler 6-player layout without wasting that effort. I actually haven't managed to find a fair 5-player setup at all, unfortunately, so will take up your offer to play (unless someone else joins ofc). Ok, make that official /in, unless anyone wants to fight me for it. The issue with these, though, is that it's harder to input moves. We can no longer say things as elegant as "up" or "down-right" or "up-left", in case there happen to be two contenders for up-left, say. I think the only reason I joined so quickly was because I did that a year or two ago, when there were no games to be had. Submit your moves in a spoiler now! Hey, so, anyone wanna team? sure, i’ll team with you. threetwoone wrote: sure, i’ll team with you. How about this - none of us attack each other until one player is dead. If we defend each other, that extends until two players are dead. If one of us attacks another, the first to attack is attacked by the other two. Sound good? It sounds suitably complex. And it's better than an equilateral alliance where the "other three" could just form an entangled opposing alliance until some Archie Duke finally shoots an ostrich because he's hungry. I'm game to give it ago. Especially as I wouldn't admit to knowing what my own tactics are going to be yet! faubi, rose, I'm probably about to become adjacent to one of you. Do you want to engage? 1, 2, 5 move down-left. Threetwoone, wanna team up against soupspoon with me? Emlightened, wanna team up againat faubi with me? heuristically_alone wrote: Threetwoone, wanna team up against soupspoon with me? Emlightened, wanna team up againat faubi with me? Soupspoon and threetwoone are both in an alliance with me, and if one attacks another, all attack the first, so I figure that you'll have a better chance asking rose, or against rose. I'll team up against faubi if she confirms she wants to engage with me, but otherwise, I'll put your offer on hold. @Moderator: Are we allowed to communicate privately, and if so, through PM or spoilers? emlightened wrote: @Moderator: Are we allowed to communicate privately, and if so, through PM or spoilers? Communicate with each other by PM, please (to avoid confusion with the moves that are in spoilers). And please add me as a recipient too in the PMs, just so I can check that nothing bad's going on in there. Apologies for the delay posting the turn- I was out.